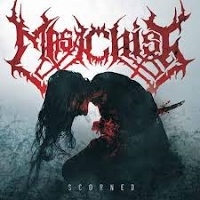 Polish export Masachist released second album Scorn last year, a collection of down-tuned, double-bass syncopated riffery that has no lacking of churning, mostly mid-tempo death metal sure to please fans of the style. The sound relays ‘Where the Slime Lives’-moment Morbid Angel (albeit with more palm-mutes, less Hell) and dissonant chord-slides of Hate Eternal, with blasts a plenty and atonal shifts riding along the go-stop-go composition. Credit must be given to Masachist for implementing appropriately spooky keyboards to sections here and there amidst the spatter, keeping the bloodletting of the cover artwork and insert front and center of the mind’s eye throughout Scorned‘s nine intestinal-stab tracks. Oddly enough, it is this synthwork and Pig’s vocals that generate the most interest for me, with growler Pig’s bark being pleasingly reminiscent of good ol’ George Corpsegrinder Fisher, with a bit of Erik Rutan thrown in. Still, the band works hard to develop their own musical voice, with tracks such as ‘Manifesto’ (100% D.M.K.M.) containing a nice eerie staccato-picked riff over the blasting, diverging nicely with the song’s preceding structure of ascending octave chording. ‘Opposing Normality’ and ‘Liberation’ reverently recalls the slithery guitar lines of Covenant-era Trey Azagthoh and mid-00’s Nergal, and if either (or both) bands have you left you wanting with their most recent releases, you might apply these tracks as replacement wounds for your …Insanus scars. ~ by cliftonium on October 30, 2013. Yum, very tasty. Reminds me of fellow Poledeath gang Gortal. Also very tasty. This entry was posted on October 30, 2013 at 7:29 pm and is filed under ALL REVIEWS, S-reviews.You can follow any responses to this entry through the RSS 2.0 feed.You can skip to the end and leave a response. Pinging is currently not allowed.